If you’ve followed this website for any length of time, you’ll realize that what I’m about to write is a big departure from the norm for me. But, I hope you’ll allow me to just bring you a little bit of my personal life and personality onto these pages for a few minutes. You see, mama friends, I have an obsession with a certain grocery store called ALDI. And a few days ago I found out that soon, we are all going to be able to get ALDI grocery delivery. Just to show you how exciting my life is, when I heard this news I squealed like a little girl who has just found out that she’s going to see Cinderella at Disney on Ice. That’s right, I’m so ingrained in my mom life that ALDI grocery delivery is the answer to my hopes and dreams. If you’re not familiar, you really have to check ALDI out. I know they’re not available in every part of the country, but if you have a local one please go. Trust me, it is life-changing. And I know this article might sound like a commercial for ALDI but it’s not. I just love it and I want to tell you guys about it. However, I can be bought, so ALDI if you’re reading, please call me. LOL!! 1) The prices are low. It makes buying organic food, gluten-free food, and fresh produce very affordable. Both my son and I have a gluten intolerance/wheat allergy and ALDI’s gluten-free line has saved our budget. 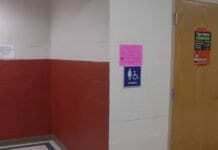 2) The stores are small. It’s only got like five or six aisles. I can be in and out of ALDI on a regular grocery trip in like 20 to 25 minutes. It’s amazing. 3) Every week, ALDI offers special products that aren’t a part of their regular line. These are called “special buy” items or “ALDI finds.” These range from gourmet foods to kids’ toys to apparel and even camping gear. Every time I stroll through those special aisles, it’s like Christmas. I never know what I’m going to find! OK so — I really do love going to ALDI to shop, so why am I so excited about ALDI grocery delivery? Because girl, I’m a busy mom, and sometimes fitting in my weekly grocery trip can be a real stretch. Also, I used to love to go on Sundays, but now that everyone has figured out how wonderful ALDI is, Sundays are just way too crowded for me to shop there. So, I’ve had to figure out another day to do my shopping. But now that we have ALDI grocery delivery I can get my amazing prices on fantastic food from ALDI any day of the week, delivered to my door. Sadly, I am not exaggerating when I say that this is a dream come true for me. So how do I get ALDI grocery delivery? 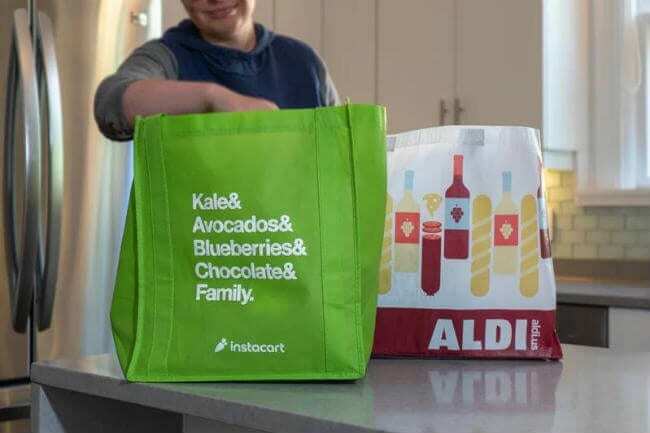 ALDI is partnering with Instacart to provide grocery delivery to its customers. To see if it’s available in your area just go to Instacart.com/Aldi. It’s not available everywhere yet, but it is coming to every state that ALDI operates in by the end of the year. I’ve heard that it will be in my home state of Ohio by November, and I literally cannot wait. I do enjoy shopping the aisles of ALDI, but during a busy week, or on a seriously rainy or freezing cold day, I might just want to curl up in my cozy pants with a cup of hot chocolate while someone else does my grocery shopping for me. HOLLA if you heard that!!! Are you obsessed with ALDI like I am? If so, are you excited about ALDI grocery delivery too? I’d love to hear what you think of my favorite store in the comments.